Food Costs > How Much Do Bananas Cost? How Much Do Bananas Cost? Although yellow bananas are the most common, especially in the United States, they can come in other colors such as red and purple. Bananas are native to tropical areas such as Southeast Asia, but these fruits can be commonly found in any farmer’s market or grocery store near you. They can also be found in Hawaii and Florida. The cost of bananas is going to vary depending on the store and the time of the season. At your local grocery store, bananas are going to cost anywhere from $0.30 to $1 per pound. A local farmer’s market may charge less than your local franchise grocery store such as Walmart of Safeway. Wholesale clubs, such as Costco, will sell pre-packaged bananas that come in two or three-pound bags. These bags can cost anywhere from $1.50 to $3. Exotic bananas such as the red and purple ones can cost $1 and $3 per pound. As an example, a farmer’s market in the Asian markets of San Francisco, California, generally sells their bananas for $0.30 to $0.60 per pound. 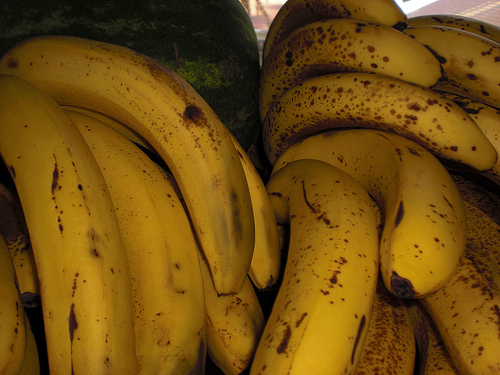 Organic bananas are usually going to cost a little more, ranging from $0.75 to $2 per pound. This will depend on the season. Southernplate.com tells us bananas are one of the best values in the produce department. She had paid about $1.40 for eight bananas and offers some wonderful recipe ideas. Organic bananas will usually be 20 to 40 percent more. It takes about three to four small bananas to make a pound since the average seven-inch banana weighs about four ounces. As for a case, there will be about 100 to 110 bananas. Bananas can be frozen overtime to help preserve its freshness. In order to do so, cut up the banana into four to six pieces. After, place the banana in a freezer bag and store in a freezer for up to two months. Bananas are a great source of Vitamin A, C, E, and K as well as fiber. It also contains more than 30 grams of carbohydrates. The average banana will contain around 100 to 120 calories. The greener they are, the firmer and less ripe they will be. Yellow bananas with a small amount of green around the stem are ideal for most people. Some, however, like the very ripe and soft yellow and brown bananas. This comes down to your personal preference. Plan your banana purchase for the week. For instance, buy a few yellow ones, a few greenish-yellow ones, and a few green ones. These can then be used over the next week and will result in less waste. Why are bananas so cheap? Bananas will produce a lot per plant and the labor, when compared to other fruit, is a lot less intensive. As compared to a blueberry, where someone would have to pick one individually, a bunch of bananas can simply be cut with a machete. Also, when compared to other fruits, they ship well and are very durable. 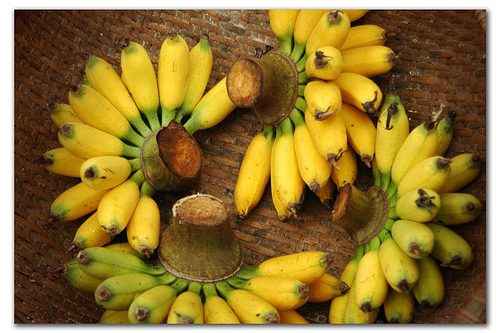 The popular Chiquita bananas come from Costa Rica, Guatemala, Honduras and Panama. To store ripe bananas, keep it at room temperature and consider hanging it from a banana tree to avoid bruising. If it’s becoming too ripe, either slice it up and store it in the freezer wrapped or consider wrapping the entire unpeeled banana in a plastic wrap. When frozen, they can last for a few months and are ideal for smoothies or fruit sauces. Wrapping the stems will prevent ethylene gas from reaching other parts of the fruit. Bananas left too long may attract fruit flies. Try purchasing from your local farmer’s market. Most farmer’s markets will charge a lot less than your bigger grocery store chains.